I have visited few places more beautiful than Death Valley National Park. A diverse variety of amazing landscape features can be found between the valley floor at 282 feet below sea level and surrounding mountains which reach heights over 11,000 feet. Although many adjectives are used to describe the park’s landscape features, the most dominant theme to my eyes is strong sunlight. I made several photographs which emphasized that theme and one photo which depicted blazing sunlight was discussed in a blog here. While driving on one of the Park’s main roads I saw clouds and haze clinging to the foothills surrounding the valley. 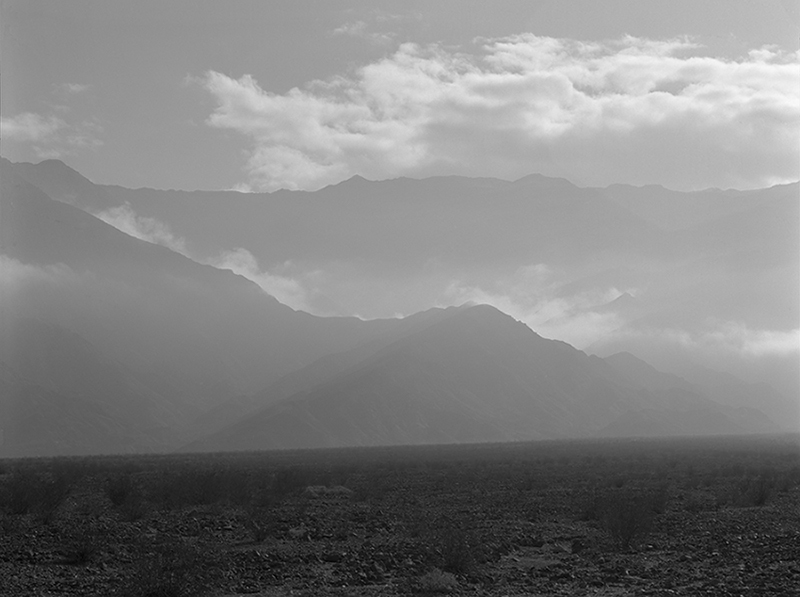 The low clouds, haze and sunlight created a beautiful mood which depicted the park’s strong sunlight differently than my other photographs in Death Valley. I found a location where I could juxtapose the sunny foreground against sunlight bathing the hazy mountains to capture the feeling of bright sunlight flooding the valley. I mounted a 305 mm lens on my 4 inch x 5 inch camera and composed a photograph. The composition felt like clouds and light were in the process of changing and I liked its dynamic feeling. I was concerned about the somewhat shallow depth-of-field of the rather long 305 mm lens (150 mm is a “normal” focal length for a 4×5 camera) so I tilted the view camera lens slightly forward to position its focused area onto both the near foreground and the mountain tops far away. A few light meter readings were acquired and they surprised me greatly. I had assumed that the sunlit foreground was one of the brightest areas of the composition but the light meter indicated that I couldn’t have been more wrong. The sunlit foreground actually was the darkest area of the composition. I acquired light meter readings again to verify the previous measurements but the same result was found. The light meter reminded me that it is difficult to disconnect our brain from our senses and an objective measurement (i.e. a light meter) is sometimes required to see what is actually there. This scene was surprising because I had been photographing in the park for a few days and the sunlit foreground indeed was the brightest (or nearly the brightest) area of those scenes (an example is here). I soon realized that today’s scene was different because the heavy haze between the camera and mountains scattered the sun’s light very much and absorbed little of it so a large portion of the incident sunlight reached the camera. In contrast to that, a smaller portion of the sun’s light reached the foreground much it was scattered by the haze above and some of it was absorbed by foreground objects so less sunlight was reflected by the foreground toward the camera. Scattering also caused the clouds and blue sky to be brighter than the foreground. The atmospheric haze was blue colored so I considered using a colored contrast filter while exposing my black & white film. Covering the camera lens with a warm-toned colored filter (e.g. yellow, orange or red) would reduce the brightness of the blue haze on black & white film whereas using a cold-toned filter (e.g. blue) would increase the brightness of the haze. In other words, using a colored filter with black & white film would allow me to vary the relative brightness of the foreground, haze-covered mountains and sky. To obtain an objective measurement of the effects of filters, a light meter is aimed through the filter and the resulting readings are compared to light meter readings for the same scene areas without the filter. First, I recorded key light meter readings without a colored filter. I placed the foreground on Zones III – IV (dark with good detail – slightly darker than middle gray) and that caused the mountains, sky and clouds to fall on Zones VI (slightly brighter than middle gray), VII (bright with good detail) and VIII (bright with slight detail), respectively. I thought those tones were excellent for emphasizing bright sunlight even though the foreground was dark because the foreground had plenty of detail and could be brightened during image editing. I considered developing the black & white film N-0.5 to lower its brightest tones one half of an f-stop (from Zone VIII to Zone VII.5) to ensure that enough texture was retained in the brightest areas of the film. However, the scene had a wonderful sense of bright light and compressing bright tones on the film would be detrimental to the feeling of strong sunlight. Since the brightest tones were located in small parts of the clouds which could be burned darker later during image editing, I thought it was best to keep all tones as high as possible on the exposure scale. Compared to the foreground (i.e. no haze), a blue filter would have brightened the mountains enough to weaken their structure and that would be unsatisfactory. A warm colored filter would have darkened the mountains and weakened the sense of bright sunlight which permeated the scene. Consequently, I decided to make an exposure without a colored filter. One sheet of Tri-X 4 inch x 5 inch black & white film was exposed with no filter at 1/60 sec and f/45-64 (read as half way between f/45 and f/64). Normal (N) film development was specified rather than N-0.5 development. I instructed my scanner to acquire a high resolution digital file at my usual resolution of 5,000 ppi and 16-bit pixel depth. The digital image obtained from the scanner without editing is shown below. I was amazed at the scanned image because it clearly shows that the sunlit foreground was the darkest area of the scene. This image clearly illustrates the power of light scattering. I carefully evaluate each image after returning home from a photo trip to learn from my experience. For today’s image, I was pleased that the sense of bright sunlight on the mountains and sky had been captured well. However, I thought the image would have been better if the mountains had slightly more structure so I should have used a light yellow filter rather than no filter during exposure. Consequently, I gave myself a grade of B for filtration even though the image obtained without a filter was quite good. The biggest problem with this photograph was a dark foreground which lacked any sense of bright sunlight. However, I don’t know how this problem could have been dealt with better in the field. I patted myself on the back for having enough foresight to place the foreground on Zones III-IV during exposure to produce plenty of detail to facilitate editing later. Thus, I gave myself an A for exposure. The Level’s black endpoint slider was moved from 0 to 60 and its white endpoint slider was moved from 255 to 242 to increase tonal contrast within the selected area. The following image shows the results of the local Levels adjustment for the mountains. Comparing the unedited scanner image and the adjusted image shows that the mountains look more realistic and solid after the Levels adjustment. Next, local retouching was performed using PhotoShop’s Burn, Dodge and Clone tools. The original image layer (image from the scanner) was duplicated, named “Retouch” and placed directly above the original layer to contain retouching edits. The sun was located on the right side of the composition so the image’s right side was brighter than its left side. That brightness helped establish the sun’s presence in the composition and thus helped support the general theme of bright sunlight flooding the valley. However, the brightness difference also pulled viewer’s eyes to the right and off of the right edge of the photo. Editing was needed to help keep viewer’s eyes more centered within the photo but also retain enough visual information for viewers to know that the sun was located off of the photograph’s right side. Many edits were done to accomplish that. For example, a thin sliver along the photo’s right edge was darkened slightly with PhotoShop’s Burn tool to help turn viewer’s eyes back into the photo. Similarly, slight darkening was done for the brightest areas of the upper clouds near the right side of the photo, the lowest cloud on the right side of the photo (slightly below the image centerline) and the small bright cloud area on the mountain topline at the right image edge. In addition, clouds rising above the sloping ridge on the image left middle were brightened slightly using PhotoShop’s Dodge tool to draw viewer’s eyes to the left more strongly. Finally, attention was directed to the photo’s biggest problem – the dark foreground which lacked any sense of bright sunlight. Placing foreground tones on Zones III-IV during exposure yielded plenty of foreground structure to facilitate editing so PhotoShop’s Dodge tool was used to lighten the foreground enough to communicate a better sense of sunlight. The retouched image is shown below. I was pleased with the image thus far and began to think that the photo might work. Overall, the image was weak tonally, however, so a global Levels adjustment layer was opened to strengthen tones throughout the image. The global Levels adjustment strengthened the entire image and improved definition within the foreground and hills. The goal of my photography has always been prints and it was time to make a test print of this image. I made a 20 inch x 16 inch inkjet print and set it aside until the next morning so I could evaluate it with a slightly clearer mind. A new test print was made and I was happy with it so my work was finished. 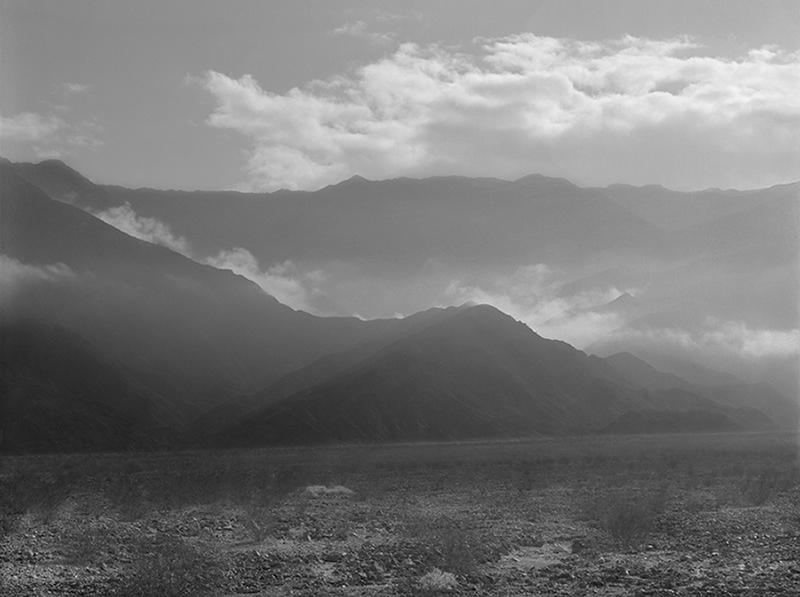 The subject of this photograph was the strong sunlight that is present in Death Valley. I believe today’s image communicates that theme well. Any comments you might have about the image, its photographic approach, the composition, or image workup will be appreciated. For a larger view of this photograph, visit here.